Analysis of the deformation of small holes cutting (small diameter and thickness). The workpiece has a burr when cutting low carbon steel, how to solve it. Analysis of the burr on the workpiece when cutting stainless steel and aluminum zinc plate with the laser cutter. Analysis of the incomplete cutting state of the laser. The solution for non-normal spark appears when cutting low carbon steel. Selection of puncture points during laser cutting. 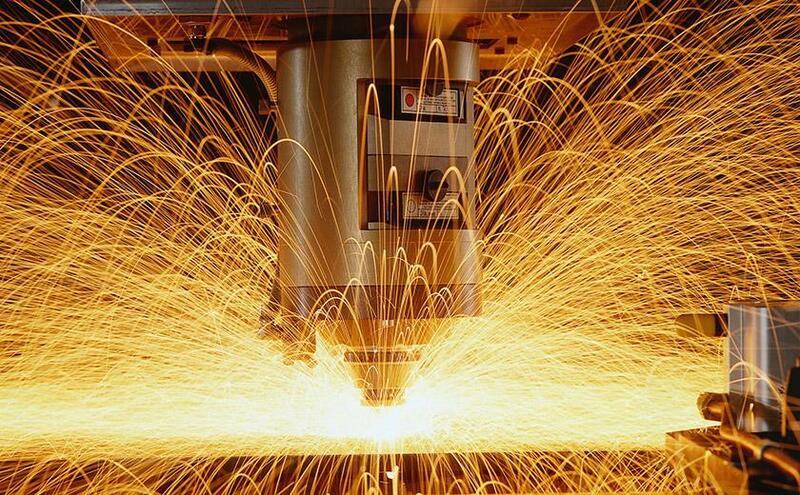 In the process of cutting sheet metal with the laser cutting machine, various problems are often encountered. Generally, for any kind of hot cutting technology, drill a small hole in the sheet metal is necessary except a few cases can start from the edge of the sheet metal. Previously, it was punched out a hole with the punch mold in the laser stamping machine, then the laser began to cut through the hole. The material formed a pit in the center after the continuous laser irradiation, then the oxygen flow with the laser beam will quickly remove the fused material to form a hole. The size of the ordinary hole is related to plate thickness. The average diameter of the blasting perforation is half the thickness of the plate. Therefore, the perforation aperture of thicker plate blasting is larger and not round. It should not be used on parts with high machining accuracy and can only be used for scrap. In addition, the oxygen pressure used in the perforation is the same as that of the cutting and it has too much splash. A pulsed laser with a peak power is used to melt or vaporize a small amount of material. Common air or nitrogen is used as an auxiliary gas to reduce the hole expansion due to exothermic oxidation. The gas pressure is less than the oxygen pressure when cutting. Each pulsed laser produces only small particles that are ejected and then gradually in-depth. So it takes a few seconds for the thick plate to perforate. In this way, the perforated diameter is smaller, and the perforation quality is better than that of blasting. For this purpose, the laser should not only have higher output power, but also the time and space characteristics of the beam. Therefore, the general flow CO2 laser cannot meet the requirements of laser cutting. In addition, the pulse perforation should also have a reliable gas control system to realize the control of gas type, gas pressure switching and perforation time. In order to obtain the high-quality incision in the case of pulse perforation, the transition technology from the pulse perforation of the workpiece to the continuous cutting of the workpiece should be taken seriously. In theory, cutting conditions of accelerating period such as focal length, nozzle position and gas pressure can usually be changed. But it is unlikely that the above conditions will be changed for too short a time. In industrial production, it is more realistic to adopt the method of changing the average power of the laser. The specific method is to change the pulse width, the pulse frequency or changes the pulse width and frequency at the same time. The actual results show that the third effect is the best. This is because the laser cutter (only for high-power laser cutting machine) is not taken the method of blasting perforation when machining the hole, but using the pulse perforation (soft puncture). This makes the laser energy to be too concentrated in a small area, charred the non-processing area, resulting in the deformation of the hole and affecting the processing quality. At this time, we should change the method of pulse perforation (soft puncture) to blasting perforation (ordinary puncture) in the processing procedure in order to solve it. For less powerful laser cutting machines, the opposite is true. It is necessary to use pulse perforation to achieve better surface finish for small hole cutting. The laser focus is not in the right position. The focus position test is needed to adjust the offset according to the focus. The output power of the laser is not enough. It is necessary to check whether the laser generator is working properly. If normal, check whether the output value of the laser control button is correct and adjust accordingly. Laser focus migration. A focus location test is required and adjust according to the offset of the focus. Instability occurs due to the long time running of the laser cutter. You need to shut down the laser cutter and restart it. For the occurrence of the above situation, you should first consider the factors that will cause the burr during the cutting of low carbon steel. But you can’t simply speed up the cutting speed because of the increase in speed sometimes can’t piercing the plate. This situation is especially prominent in the processing of aluminum zinc plate. At this time, the other factors of the laser cutting machine should be taken into consideration, such as whether the nozzle should be replaced, and the guide movement is unstable. The laser cutting speed is too fast, and the linear velocity needs to be reduced. In addition, it is important to note that when cutting 5mm carbon steel plate with the laser cutting machine, it needs to replace 7.5 “focal length laser lens. This situation will affect the quality of the cutting section of the parts. The loss of laser nozzle and should be replaced in time. Under the condition that no new nozzle is replaced, the cutting work gas pressure should be increased. The screw thread at the joint of the nozzle and the laser cutting head is loose. For this condition, the cutting should be stopped immediately, check the connection status of the laser head, and reinstall the screw thread. In the process of processing, the material is formed into a pit in the center after the continuous laser irradiation. Then the working airflow with the laser beam will quickly remove the molten material to form a hole. This hole is similar to a threaded hole of thread-cutting. The laser beam takes this hole as the beginning point of processing for contour cutting. Normally the direction of the path of the laser beam in the flight path is perpendicular to the tangent direction of the cut contour of the processed part. Therefore, during the time from the laser beam penetrating the steel plate to cutting the contour, the cutting speed will have a big change in the direction of the vector, that is the 90 ° rotating in vector direction. This will result in a rough cut surface on the cut section of the processed material. This is mainly because in a short period of time, the changes in the moving of the laser beam in the direction of the vector direction are very fast. Therefore, we should pay attention to this aspect when using laser cutting parts. Generally, when the design part has no roughness requirements for the surface cutting, no manual control will be set in the laser cutting programming so that the control software can automatically generate puncture points. However, when the design has a high roughness requirement for the cutting section of the parts to be machined, it is important to take note of this problem. It is usually necessary to manually adjust the starting position of the laser beam when preparing the laser cutting program, i.e. the manual control of the puncture point. It is necessary to move the puncture point produced by the laser program to the desired reasonable position to meet the requirements of surface precision of the machining parts.